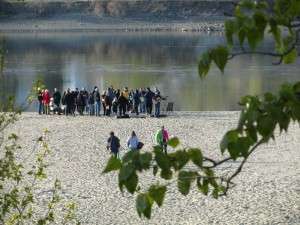 April 21 – 7:30 a.m. – Early Service at the Overlander Park Beach located on the north s7:30hore of the Thompson River east of the Overlander Bridge. Please dress warmly. Also, 10:00 a.m. at K.U.C. with wonderful music and a joyful celebration. Image: Overlander beach, Easter morning worship. P. McColl photo.